Ice Warren is the eighth level of Donkey Kong Jungle Beat and the second area of the Apple Kingdom. 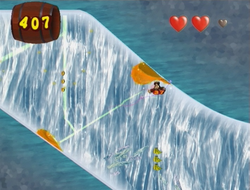 This is the second ice level in the game and the first one to be traversed on foot. Ice Bakkies attack Donkey Kong here, but they can be dispatched with his clap attack. Helper Monkeys help Donkey Kong make progress and get to inaccessible areas, and also introduces the Dragon Slot. Throughout much of the level, though, the ape slides down slippery surfaces and collects the many Banana Bunches that fill the level. At the end of the level, Hoofer helps Donkey Kong jump over large gaps in a bonus game. Each jump nets Donkey Kong ten bonus beats. After completing the level, Donkey Kong battles Turret Tusk. This level shares its music with Aurora Glacier. Ice Warren begins with two stair platforms leading to an icy, straight pathway. There are some Ice Bakkies on the tops of the area to attack Donkey Kong here. A small slide of ice is just beyond here, and Donkey Kong must slide down it while plowing through snowmen. Blooms can be found just before finding the edge of the cliff, and luckily, an icy Banandelion is at the end of it. This plant can fling the Kong to a Helper Monkey, who is able to swing him up to more Blooms and Helper Monkeys. Donkey Kong is eventually sent to another small slide, which is too icy for him to stand on. When he gets to the bottom of this slide, he can find a small, open area with enemies, Helper Monkeys, and more Blooms. Donkey Kong must use his wall jumping moves and the Helper Monkeys to grab the Blooms and reach the top of the area, where there is another slippery surface. As Donkey Kong slides down this, he runs into many Banana Bunches, most of which are trapped in bubble and need to be collected by a clap grab. A Helper Monkey also throws the ape over some enemies as he travels down, as does another one located farther down the area. Donkey Kong is soon thrown into the air by a Helper Monkey, landing in a lower area filled with two large Snow Moles jutting out of the top and bottom of the cavern. Once he passes them, though, he can activate a Dragon Slot that sends him to a new area. Here, he meets another Helper Monkey, as well as a Kobu Kokko. Once Donkey Kong defeats and passes it, he finds a thin passage containing another Snow Mole. If he sends a sound wave at it, it hides in a small crack in the ice, keeping it out of the way. There is another slide by this enemy, and as the ape heads down it, he comes up to many more snowmen, along with a single Helper Monkey. Soon, Donkey Kong should make his way to some small, yellow fairies. If a sound wave is sent to them, they form orange trampolines, which the ape can bounce on to travel faster. There are only a few of them however, and once they are gone, the ape must continue to slide down without assistance. A few spikes are in the way as he journeys down this area, as well as some more sharp, gray creatures. Donkey Kong must avoid each of these foes and eventually find his way into a small gap to land on Hoofer. While riding on the Jungle Buddy, the ape grabs the giant apple to complete the level. Several platforms lie in front of the fruit, and a minigame to earn several extra beats can be played. Upon missing a ledge, beats are earned equal to the number of successful jumps multiplied by ten. This page was last edited on April 12, 2019, at 13:06.